Wilkinson and Kupers (2014) The essence of scenarios: learning from the Shell experience, Amsterdam University Press. 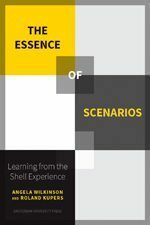 On March 4th 2014, an exciting new book on working with scenarios was launched by Amsterdam University Press: The essence of scenarios: learning from the shell experience by authors Angela Wilkinson and Roland Kupers. Both authors have an impressive history on working with scenarios inside and outside the Shell company and through their book provide us with an insiders view on the roll of scenarios and the famous scenario team in Shell from the early 1960’s up till now. The book gives us an insight in the development and fine-tuning of the ‘gentle art’ of scenario planning in Shell and is basically a unique case study with educational insights for both beginners and more experienced foresight experts. “What we have done is reconstruct the history. This was needed in the first place for Shell colleagues who need to know about this practice of scenario planning, but also more broadly, considering the uniqueness of Shell as an organisation working with scenario planning. Especially because 85% of scenario studies are based directly on the Royal Dutch Shell process or derived from it, according to a study by the Hart Rudman Commission. People need to know this history in order to reproduce the success that Shell has, why it came about and how it came about. Indeed it is remarkable for a technocratic company to use storytelling, reshaping the analysis of what may happen. “Predictions about the future are always wrong. Shell is not trying to predict the future, but attempts to navigate the iceberg. What you read in the newspapers about trends in current affairs are the visible parts of the iceberg. But it is also important to look beneath the surface, see the structure and look further ahead. “Scenarios in Shell are not about forecasting. Scenarios reflect an understanding that linear concepts are not the way to think about time. They are manipulations of time horizons to rethink the present situation that you are in. Imagine the future and think about what it tells you about the present. “Scenarios are neither predictions, nor preferences. They show the art of navigation, exploring plausible future space. They harness intuition. From a scientific perspective, they help to sense things that are happening. “It is an intuitive inquiry and starts by interviewing senior leaders: what are you challenged by? How can you make things happen in a world that is susceptible to change? An organisation working with scenario planning should not be looking for a futures guru, but for a way to think about futures. “There seems to be a persistent myth claiming that Shell managed to forecast the oil crisis before anybody else. Real learnings in fact are about understanding issues that are relevant to your organization, having the management board actively involved in scenario planning. Another important thing to realise is that it is not about the scenarios as a product or the book. Others can read this, but it is not helpful. Scenario planning is an imperative to roll up your sleeves as an organisation. Scenarios are the wind tunnel that throws your strategy around. For example, the Mont Fleur scenarios and the transformative scenario practice of Adam Kahane (also with a background in Shell scenarios) convened leaders to think the future of South Africa. Instead of sticking with their conviction. “Strategic vision is supposed to be at the heart of what organisations do, according to Pierre Wack, one of the key leaders in Shell at the base of the culture of scenario planning. Scenarios are built around the strategic vision and leads to planning for certain options. Scenarios are part of a broader plan of making sense of the future. Apply them to problems where you face serious changes. In hindsight it creates a culture where you can ask questions that give a context. It makes disagreement an asset instead of a problem. “As a foresight expert and experienced user and creator of scenarios, I was immediately triggered by this book and reading it I was glad to see it lived up to my expectations. First of all, everyone who works with foresight methods knows or has heard about the importance of scenarios for Shell. The example of Shell is often referred to, almost in a mythological manner, as a best practice of working with scenarios. This book provides detailed insight in the practice and clears the mythological fog. The authors show us that using the Shell method is not, even within Shell, a guaranteed recipe for success. The Shell scenario team has had many challenges with commitment, skepticism and proving it’s worth and I find it somehow a relief to read about the challenges they were faced with and how they were met. Also I think an important lesson here is that working with scenario, changing the way people think and talk about uncertainties and strategic options is not something that is easily done, or can be done in just a few months of creating scenarios. It’s a continuous effort that takes time and practice. But definitely an effort worth undertaking. “Wilkinson and Kupers present a fascinating ethnographic journey about the almost fifty year culture of scenario practice in Shell. As the example of Shell is so often mentioned as a success story on the benefits of scenario planning in organisations, it felt very important to read the inside story, to hear also about the struggles that every scenario practitioner faces. Building on illustrations from the Shell case, the authors have also grasped some essential lessons from scenario planning. For me, one of the key insights from the book is that scenarios are a means to talk about the future in a safe space. It depersonalises thinking frames from individuals into storylines, providing the foundation for a better quality of strategic conversation. In addition, they phrased “the future in the present”, a way to see the present situation more clearly through using the perspective of alternative futures. This is a relevant insight also central in other approaches, such as Three horizons. Lastly, scenarios can be used as a lens on the signals of change and so called black swans the organization can ‘see’ through using them. As such, scenarios are more effective contribution to a strategic early warning system than simple horizon scanning would.